The fortunes of the azure blue are waiting for you in this underwater Novomatic slot. The Dolphin’s Pearl is filled with underwater sea creatures like Lobsters, Sea Horses, Angel Fish and Sting Rays. The Dolphin is the Wild symbol and will substitute all symbols except for the Pearl. If the Wild symbol is substituting, the winnings will be doubled. The bonus feature is triggered by hitting at least 3 Pearl symbols. Once you have achieved this, you will get 15 free spins where all winnings are multiplied by 3. 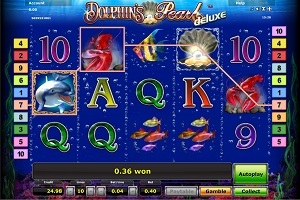 Graphics & Appearance: Dolphin’s Pearl Deluxe has a nice under water design with some bubbles and sea creatures. This is a lovely slot with beautiful colouring, clear and simple distribution of tabs, push buttons and paylines which make it very easy to navigate. Gamble Feature: You gamble by a 50/50 chance of picking the next colour of the card to be revealed from a deck. If you pick the right colour you double your winnings and you may gamble again or collect the winnings and return to the spins. If you pick the wrong colour, you lose the gamble and return to the reels. Game Symbols: The Dolphin is the Wild symbol and the open Sea Shell with a Pearl is the symbol that will trigger the bonus feature if you hit at least three of them. There are also some symbols of marine life as the Lobster, Sea Horse, Angel Fish and a Sting Ray. The 10, Jack, Queen, King and Ace is the lower paying symbols. Bonus Feature: In order to trigger the bonus feature, which are 15 frees pins, you will need to hit at least three Pearl symbols. Once this is done the free spins will start to spin. All winnings in the bonus feature are paid out multiplied by three. You will also be able to re-trigger the bonus feature while you are playing the feature. In other words, you have a good chance to cashin on some big money. Betting Options: The Dolphin’s Pearl has 10 paylines and 5 reels. You can easily set your stake preference by changing the number of paylines and your stake by using the + and – symbols on the dashboard. Game Features: The Dolphin’s Pearl has an Autoplay feature which is very easy to start and stop. Please note that you will not access the Gamble Feature while you use the Autoplay. The bonus feature will of course stop the Autoplay and take you to the free spins.